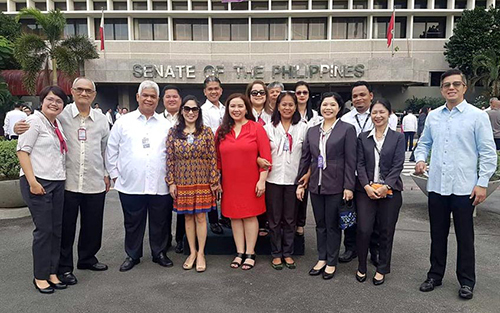 Back to work: Senate Secretary Myra Marie D. Villarica (fourth from left) poses with her staff and some Senate officials after leading Monday’s (Jan. 7, 2019) flag-raising ceremony. Villarica, in her New Year’s Message, steered Senate employees to remain dedicated to their tasks in providing senators administrative and technical support. “With the right attitude, I am sure that the daunting challenges that our country will face in 2019 will neither discourage us nor dim our hopes and dreams for our motherland,” she said.